Welcome to another Tutorial Tuesday! 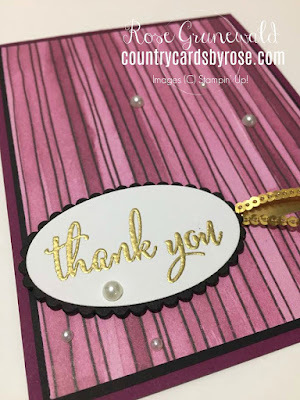 I've got a crazy SIMPLE Thank You card to showcase for you today using the Love What You Do bundle. This is the last week of the Share What You Love promotion, so make sure you get your bundle with your FREE goodies before this deal slips away! You can make this incredibly easy, elegant, BEAUTIFUL card by following along below. If you like you can click HERE to get a printable PDF version of these instructions. Use multipurpose liquid glue to attach your DSP card front to your Basic Black Mat. Attach the thin gold foil stripe across the lower third of your card front. On your scrap whisper white cardstock, use your embossing buddy to remove any static, and stamp your thank you sentiment using Versamark ink. Add your gold embossing powder to your stamped sentiment, and heat until melted with the heat tool. 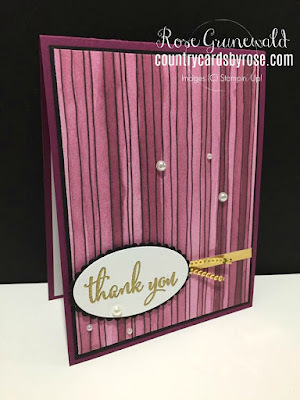 Use your 2nd to smallest layering oval to die cut your sentiment with the big shot. Die cut your 2nd to smallest scalloped oval out of your scrap basic black cardstock. Use liquid glue to attach your sentiment to the scalloped basic black mat. 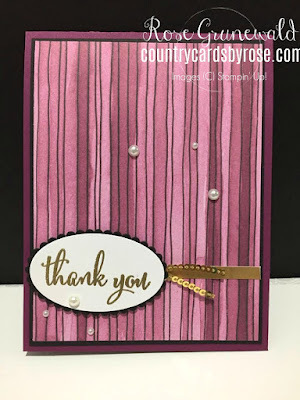 Use dimensionals to attach your sentiment over the left side of the gold stripe you already added to your card front. Use mini glue dots to attach a small piece of gold mini sequin trim to the right side of the sentiment. Add 3 basic pearls to the lower left corner of your card front, and add 3 basic pearls to the upper, right side of the card front. 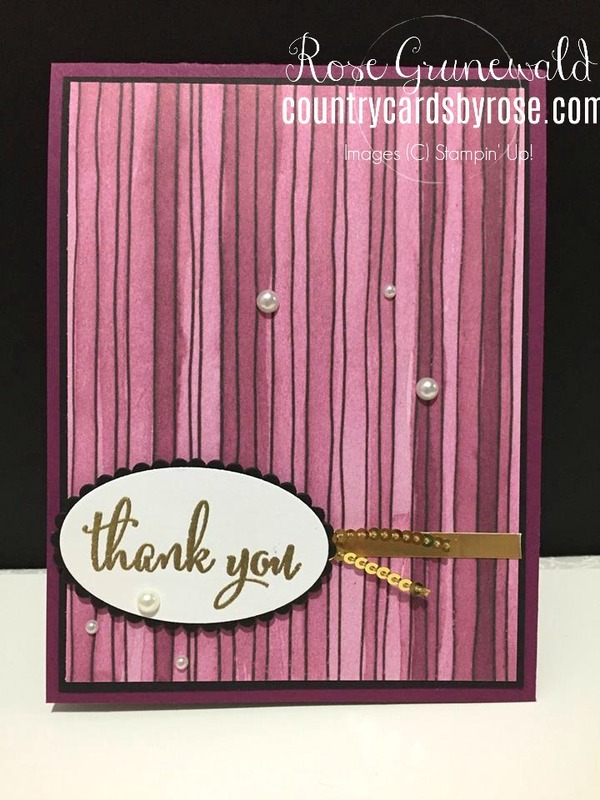 Attach your finished card front to the Rich Razzleberry card base. Attach your whisper white panel to the inside of your card base.